The Jaffna Peninsula is surrounded by many small islands and it is situated in the northern part of Sri Lanka. The culture and tradition of this beautiful city is rich, colourful and unique. Cinkai Ariyan Cekaracacekaran of Cakravartti Nallur in Cevvirukkai Nadu was the founder of the Arya Cakravartti Dynasty. The Kingdom of Jaffna under the Arya Cakravarttis remained an independent monarchy with its capital in Nallur, Jaffna. During the height of its power and prosperity, under the Arya Cakravarttis, the Kingdom of Jaffna was the most powerful kingdom in the Island and it was under a separate administration. The Arya Cakravarttis were powerful both in the sea and on land. The Tamil people had a Sovereign State in the Island and they have been living in Sri Lanka since prehistoric times. The "Kailayamalai" asserts that Cinkai Ariyan Cekaracacekaran made Nallur the capital of the Kingdom of Jaffna. Thus soon after Cinkai Ariyan’s arrival, he commenced the task of building a capital city and he named it Nallur (means a “Good City or Place”). The Arya Cakravartti, Kings of Jaffna, were Saivites. On an auspicious day and time suggested by the astrologers, the foundation stone was laid and four walls were raised. The capital city of Nallur was strongly fortified with all its ramparts, defensive towers, gates, beautiful Palaces for Royalty, Mansions for the Ministers, Halls of Justice, Temples, dwellings for Brahmins, warriors, court bards, traders and artisans, quarters for the soldiers, and an akkiraram (residence for priests), large open courtyards, market place, baths, stables for elephants and horses, beautiful flower gardens, chariots were built by skilled artisans and the fortress round the city etc. Nallur was a royal city that had been the capital of the Kingdom of Jaffna for centuries. The Nallur City was part of Cinkai Nagar where the Arya Cakravartti, Kings of Jaffna had their Royal Residence. In 2013 research carried out by Professor S. Pathmanathan and Professor S. Krishnarajah, a Tamil inscription was found in Kantharodai. It seems Arya Cakravartti, Kings of Jaffna, had first ruled from Kantharodai, and later the capital was moved to Nallur. The Royal city of Nallur was laid out as a large square and the city was fortified on all four sides by high stone walls with defensive towers. The purpose of the walls and defensive towers was for protection of the Nallur Rajadhani. The Capital city of Nallur was divided by two principal roadways, North-South and East-West that connect the four entrances to the city. There were four main entrance gates to the capital city in all four directions: North, South, East and West. All four principal entrances to the capital city were identical. Nallur Rajadhani is designed according to the traditional Hindu system of town planning concepts. According to V. N. Giritharan (Nallur Rajadhani: City Layout) During the Vedic period itself the architectural knowledge and capabilities of Hindus had progressed a lot. The branch of science dealing with architecture was called 'Vaasthu-Vidhya'. And, the books that enunciate this were called 'Vaasthu-Sasthra' works. Mythological books like 'Matsyapurana', 'Vishnu dharmothra purana' and so on, and books on Scripture like ‘Hayasirsha Pancharatra Agama’, 'Vaiganasa Agama' etc lay down the rules and regulations of temple-structure. In the mediaeval period some more books came into being in this branch of science. Manasara, Shilpaprakasha and the like are noteworthy. In Tamil also there appeared books such as Chinthamani, Sirparathnam etc. Though there exists some dissimilarities between these, they were having a common viewpoint in general. Usually the divine sculptor Viswakarma is called the principal author of North Indian books on architecture. Mayan is usually referred to as the principal author of south Indian works. From the rules and norms laid down by these books on architecture we can see how much religion had influenced the structural patterns of the city and its buildings. The "Kailayamalai" asserts that Cinkai Ariyan Cekaracacekaran established the Royal Residence at Nallur in Jaffna. Cinkai Ariyan ordered the construction of the Royal Palace and the foundation stone of the palace was laid on an auspicious day and time suggested by the astrologers. The main Royal Palace existed in the North-East section of the Rajadhani. The beautiful Palace was splendid and surrounded by strong fortified walls on all the four sides. The Royal Palace supported by lofty columns that were carved with ornamental designs. It consisted also of an upper storey, open Durbar for public audiences, large open courtyards, the Halls of Justice, Coronation Hall, Banquet Halls and an Audience Hall which was adorned with paintings and garlands of pearls. The Throne of great splendour was made of the best available material and adorned with Ivory, Gold, set with precious gems and priceless Pearls was placed in the Coronation Hall. The state rooms which were supported by decorated pillars covered with gold, high containing terraces, windows and wide balconies faced toward the city. It was built for the King (Arasan) to appear before the public on special occasions and during festivals. His palace always had a large establishment. The apartments of the Queen (Arasi) were accessible only to maidens of noble birth and not accessible to males. There were many secret passages and underground tunnels built for defensive purposes and it was used in times of war. The secret passages were used to travel safely and escape routes in times of siege. Also there were other Royal Palaces that existed in the Nallur Rajadhani. After the Royal Palace was constructed at Nallur it has been the residence of Cinkai Ariyan Cekaracacekaran. It was from here that his descendants ruled over the Kingdom of Jaffna and Nallur developed into a flourishing town of modest proportions under the Arya Cakravarttis. The Royal Palaces had beautifully decorated Banqueting Halls large enough to entertain more than thousands guests. The Arya Cakravartti, Kings of Jaffna, were known for their generous hospitality. The guests were entertained according to their inclinations; food and drink were served to every guests. In the royal palaces and royal households, although the general diet consisted of rice, vegetables, pickles, curds, milk, ghee and fruits. According to C. S. Navaratnam (Tamils and Ceylon), vegetable oils like "Gingili" and "Mi" (Native Olive) were extensively used for the culinary purposes. The oil of the "Margosa" was used for the lighting of lamps. Brahmins and the Upper Classes were mostly vegetarians. The banquet dinners for Royalty, Nobility and Upper Classes were served in golden vessels in a lavish style. The Classical Music, Drama (Nadagam), Traditional dance, Tamil literature, Poetry and also other Cultural events in history have taken place within the walls of the Royal Palace. Cinkai Ariyan Cekaracacekaran ordered his Chief Minister Puvanekavaku, to build Hindu Temples in the four directions around the city for divine protection. The Hindu Temples were erected beside the four main gateways of the Nallur Rajadhani, Veyilukantha Pillaiyar Kovil on the East, Veeramakali Amman Kovil on the West, Kailaya Vinayagar Kovil on the South and Sattanathar Kovil, Thaiyalnayaki Amman Kovil and Salai Vinayagar Kovil on the North. The ancient Nallur Kandaswamy Temple stands majestically in Nallur Rajadhani in Jaffna. The Nallur Kandaswamy Temple is a prestigious temple in Jaffna, it is one of the most famous and significant Hindu temples in Jaffna District. 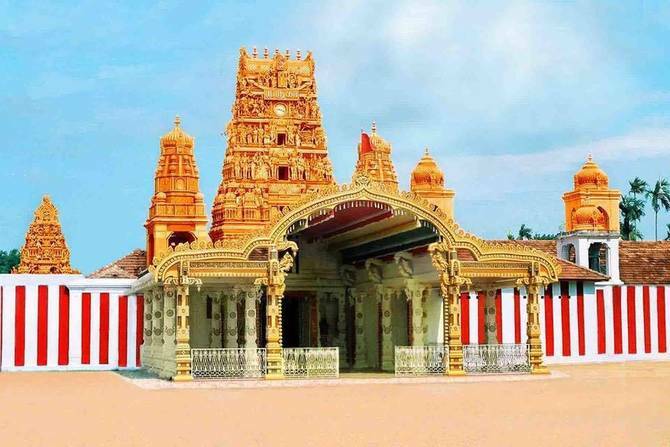 The Nallur Kandaswamy temple was originally constructed in a place called Kurukal Valavu and it existed in the North-East section of the Rajadhani. 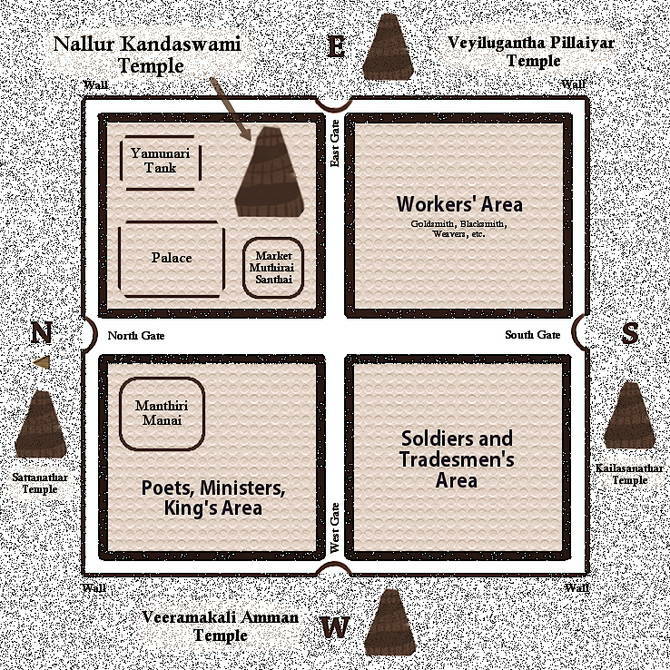 Due to foreign invasions, the Nallur Kandaswamy temple had to be relocated several times in different places within Nallur area. The shrine is dedicated to Lord Murugan (Skanda, the Hindu war God), the presiding Deity is Lord Muruga in the form of the divine Vel. The ancient Sri Kailasapillaiyar Royal Temple of the Kingdom of Jaffna still stands majestically in Nallur Rajadhani in Jaffna. "Kailayamalai" asserts Cinkai Ariyan Cekaracacekaran had long cherished in his mind an idea to build a temple at Nallur for Lord Shiva, whom he had worshipped at Madurai in the form of Sokkalingam and this was working day and night in his mind. Cinkai Ariyan Cekaracacekaran sought an auspicious day to commence the work and on the fixed hour started the work of construction and the temple was dedicated to the Lord Kailayanathar. After completing the construction of the Sri Kailasanathar Temple of the Royal Court under his personal direction. Cinkai Ariyan Cekaracacekaran conducted a consecration ceremony and named the temple after Kailayanathar and thus it became the third Kailasa (Kayilayam). The first Kumbhabhishekam of the Kailasanathar Kovil was performed by Cinkai Ariyan Cekaracacekaran and he used it as his private shrine, were he worshipped day and night. 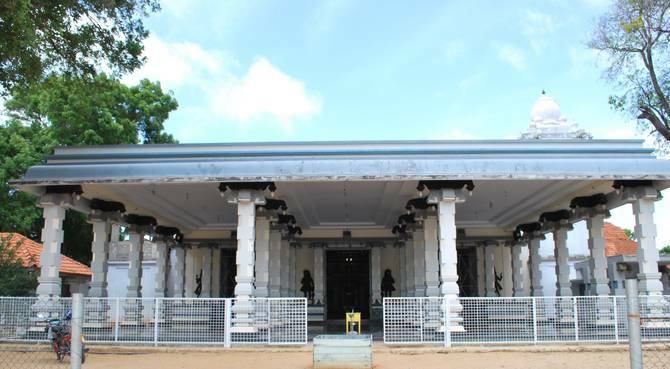 The Arya Cakravartti, Kings of Jaffna, were Saivites and the Royal Temple was known as Sri Kailasanathar Kovil and later the name of the temple was changed to Sri Kailasapillaiyar Kovil. Yamuna Eri the beautiful pond was built by King Cinkai Ariyan Cekaracacekaran and it is situated close to "Manthiri Manai" the Royal Palace at Cankili Thoppu in Nallur. Yamuna Eri was built with walls on three sides in the shape of the Tamil letter "ப". The rim of the pond is covered with stone blocks and there are stairs leading down to the pond and a secret underground tunnel connects to the “Manthiri Manai”. The River Yamuna also known as Jamuna is one of the most important and sacred rivers in North India. Water was brought from the sacred Yamuna River and mixed it with the water in the pond, hence it came to be called "Yamuna Eri". During the reign of King Cinkai Pararacacekaran (1478-1591), he redecorated the capital city of Nallur, reconstructed the Yamuna Eri and built new temples for the well being of his subjects. According to V. N. Giritharan (Nallur Rajadhani: City Layout) The dwellings for Royal poets, Ministers, Arasakesari Valavu, Kurukkal Valavu, Cankili Thoppu and Pandarakulam (Pond) existed in the North-West section of the Rajadhani. Arasakesari Valavu: Arasakesari was an eminent Royal Scholar who lived in Nallur, and was a nephew of Cinkai Pararacacekaran. Arasakesari became the Monarch’s son-in-law by marrying Ilavarasi Maragathavalli and Arasakesari was the brother-in-law of Paranirupasinghan Mudali. The place where they lived is even now called “Arasakesari Valavu”. Worker’s Area: Goldsmiths, Blacksmiths, Coppersmiths and Weavers existed in the South-East section of the Rajadhani. The Royal Staffs, Soldiers and Traders existed in the South-West section of the Rajadhani. The following are important area or place names in Nallur, Jaffna, Cankili Thoppu, Manthiri Manai, Pandara Maalikai, Cankiliyan Veethy, Arasa Veethy, Rasavinthoddam Veethy, Pandara Kulam, Arasakesari Valavu, Kurkkukal Valavu and Arasaveli are still in use today. The structure known as the "Manthiri Manai" is a heritage site and surviving section of the Royal Palace complex and the Land on which the "Manthiri Manai" stands is called "Cankili Thoppu". The “Manthiri Manai” existed in the North-West section of the Rajadhani. In 1519, Cankili Raja (I) Cekaracacekaran usurped the throne of Jaffna and he offered to be the Arasan only in name and let Ilavarasan Paranirupasinghan run the Kingdom as the Chief Minister. But Paranirupasinghan Mudali had no choice, he accepted the position and served as the Chief Minister. The Manthiri Manai (Minister’s Abode) was formerly the Official Residence of the Chief Minister Paranirupasinghan Mudali son of Cinkai Pararacacekaran (1478-1519) and Valliammai Arasakesari. In "Mathiri Manai" there is an ornamental gateway leading to the Ancient Abode and the main entrance is through a large arched porch. The existing two storey Abode structure is very unique, has a beautiful architecture and the interior structure has elaborate wooden carvings embedded with intricate designs. On the outside of the Abode there is a well and a concrete wash basin. Through the back of the Abode an entrance to a cellar in which there is a flight of stairs leading down to another room, itself linked to a third room by more stairs. The Abode has secret underground tunnels, which have been abandoned and were buried. The Manthiri Manai is a blend of European and Dravidian architectural styles. The front part of the Manthiri Manai was later modified during the Dutch colonial period. In Nallur Rajadhani, its principal surviving remains are Manthiri Manai, Yamuna Eri and the Entrance Archway to the royal palace. 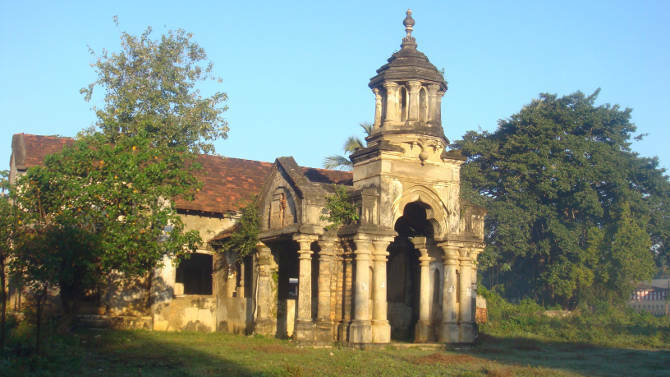 The Manthiri Manai and other historical ruins have been neglected for decades and badly damaged during the conflict. The "Manthiri Manai" surviving section of the Royal Palace complex and the Lands surrounding Manthiri Manai, is a heritage property. All the Lands belonged to the King (Arasan). The Lands and the surviving section of the Royal Palace complex shall not to be sold, transfer, leased or disposed of in any manner. 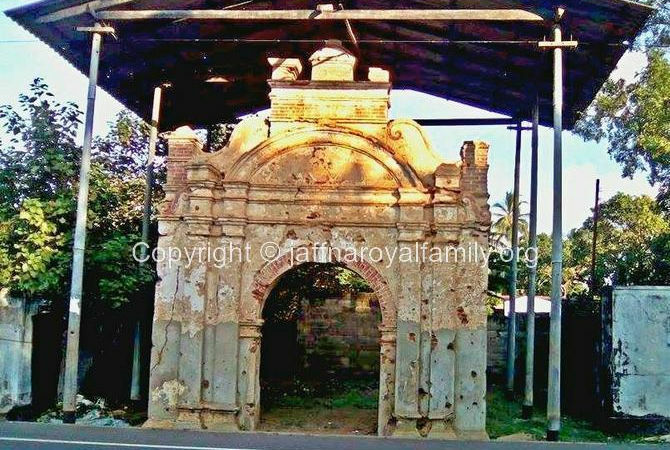 The "Manthiri Manai", "Yamuna Eri", "Entrance Archway" to the palace and the Statue of King Cinkai Arya Cakravartti Cankili (II) Cekaracacekaran are important landmarks of the Nallur Rajadhani in Jaffna. According to John. H. Martyn (Martyn’s Notes on Jaffna), The Entrance Archway to the Royal Palace at Cankili Thoppu in Nallur was acquired by the British rulers in August 1907. The Entrance Archway is sheltered by a roof and still being preserved. The Royal Market was situated at Muthirai Santhai in Nallur and the "Muthirai Santhai" is the focal point of Nallur Rajadhani. The Royal Market existed in the North-East section and it was in the middle of the two principal roadways of the Rajadhani. The market place was situated in such a way that the Arasan could watch the proceedings of the market from his royal palace. The market was held in a large area and a wide variety of articles were sold with the merchandise neatly arranged in rows. There were different types of merchants who sold items in the market. During the reign of the Arya Cakravartti, Kings of Jaffna, every cloth which was handled in the course of the trade within the Kingdom had to bear an official seal. The cloth that did not bear the sign of the official seal could not be sold. Also a tax was levied for affixing the official seal. Later this custom was continued by the Portuguese, who used their armillary sphere as the official seal. The Arya Cakravartti, Kings of Jaffna, for the purpose of defending their Kingdom against all enemies had forts erected at Nallur and Kopay. There were three small forts to safeguard Nallur Rajadhani and they were built in three places called Kopay, Columbuthurai and Pannaithurai (Kottaiadi). According to V. N. Giritharan (Nallur Rajadhani: City Layout), there were main roads to connect these forts to Nallur Rajadhani and along these main roads there were check posts. Also there were forts in Mannar, Kayts and Chavakachcheri. According to C. S. Navaratnam, besides, the Arya kings built a special refuge "Pilathuvaram" (an underground building) with halls and apartments at Thondaiminaru to take shelter in times of emergency. Later fortress at Kopay was also captured and destroyed by the Portuguese. 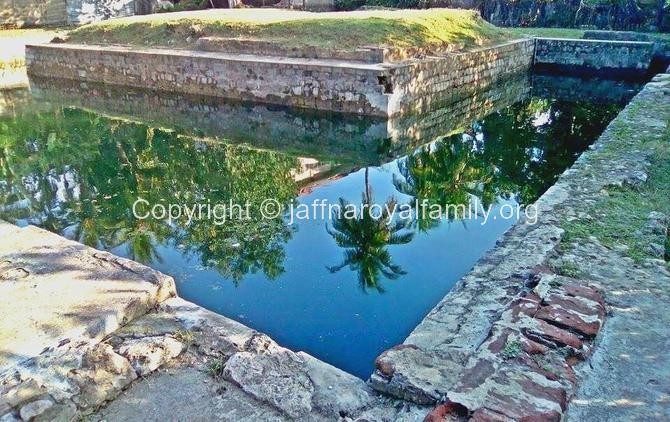 The site of the Palace inside the Fort, marked with archaeological remains, is still remembered as "Raasa Maaligai" (Royal Palace) in Kopay. The Head of the State was the Arasan. According to C. S. Navaratnam, the idea of the sovereign as the parent of his people is the basis of Tamil politics. The sovereign can seek no salvation for himself individually, but can obtain it by the faithful discharge of his duty to the highest power and to his subjects and to all around him. The Arasan was assisted by a Council of Ministers in his daily work, Military Commanders, Priests, Astrologers, Physicians, Envoys and Spies. The Arasan always lived in his capital except in times of war. The relatives of the Arasan were the employees in the palace. The Arasan was protected by loyal bodyguards (Doluvaras) who were expected to lay down their lives in carrying out their duties and they remained loyal to the Arasan. Cinkai Ariyan Cekaracacekaran generally rode on an elephant or on horseback or on a chariot drawn by horses. The chariots were built by skilled artisans. The Arasan brought prosperity to his realm and the subjects were so much attached to their sovereign. On every festival occasion, whether in public temples or in private dwellings prayers were offered by the subjects for victory and prayed for the Arasan's prosperity and long life. When the Arasan visit in the town, his subjects received him with the greatest respect and the subjects present the Arasan with various gifts. According to C. S. Navaratnam, that the three great virtues of the Tamil Kings were Heroism, Justice and Charity. In ancient times drums played a great part and in the past, there were several different drum beats for the drums. Big drums resounded at the palace gate, early at dawn and at sunset. The drum and the conch were sounded on the battlefield. According to C. S. Navaratnam, three kinds of drums were sounded indicative of the three different phases of royal activity, the War Drum (Vira Murasu), the Justice Drum (Neethi Murasu) and the Gift Drum (Kodai Murasu). By the beat of the drums, Arasan order to the subjects were announced. According to C. S. Navaratnam, the "ur" was both town and village. It formed a unit for administrative purposes. The Thalamaikaran or headman was in charge of the administration of the village. The Adigar was superior to the headman and had to supervise the work of several headmen. These Adigars were appointed by the king. They were not paid by the crown, but were paid from the contributions of the well to do castes the Vellalas, the Thanakaras and the merchant class. Then there was another collective contribution to the king by each caste. Among the Careas, the Pattankatti collected a tax on every "dhoney" on its arrival at port. The "Marala" on the dead was levied for the King by the issue of a cremation license. All land was supposed to belong to the king. He granted lands for services rendered either for a stated period or at most for life. In the latter case on the death of the grantee, his heir would as a rule obtain a regrant on application to the king and on payment of a fee. Uliyam services were due from the lower castes who had to work gratis for twelve days in the year on public utility works. If they failed, they were fined. "Pandarapillai", the tax collector, went round collecting all dues and contributions. The aged had to supply Palmyra shells for use as fuel at the forges. All wrecked ships on the coasts were the property of the king and Cankili Raja (I) Cekaracacekaran seized many Portuguese ship that were stranded off his coasts. Further the Jaffna kings had a separate carriage of their own. Justice was administered free of charge impartially by the village Panchayat which consisted of the chief elders of the village. This council acted as a sort of arbitration court. It followed the land custom, the trade custom and the social custom. The King's Court was the final court of appeal. Punishment in those days were severe even for trivial offences. Thesavalamai was the authority in case of Land suits. It is the Law of the Land even today and is applicable to the Tamil People of Jaffna only. According to C. S. Navaratnam, in war, the Jaffna kings often sent their generals to the field, but sometimes the King took the field in person. The fighting men of the king belonged to a military caste among the Tamils-Maravars. The males of this tribe had to undergo military training between the ages of sixteen and twenty-four and thereafter they usually took to the cultivation of the lands allotted to them by the state. Whenever their services were required, they left their farms and served in the army. These forces were loyal to the king. The Kondaikaras were a class of efficient troops in the armed forces. In later times, the Vadagars were also employed in the king’s services. The Arasan maintained an well-equipped army. 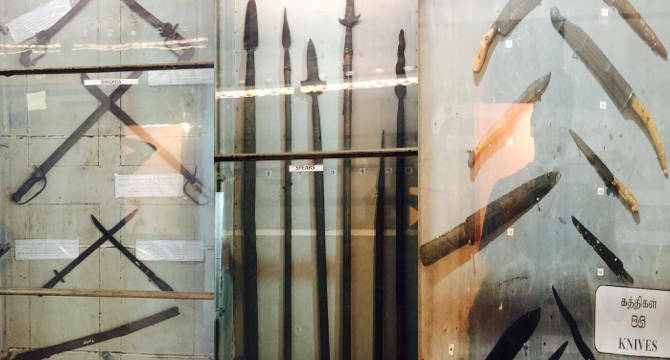 The main offensive weapons used by the Tamil Soldiers were Swords, Bows and Arrows, Spears, Javelins, Axes and Shields. The Arya Cakravartti, Kings of Jaffna, had embossed the legend "Cetu" ("செது") on their white shields. In the fourteenth century, the armour of the Jaffna troops were coloured and each regiment seems to have had a colour of its own. In 1618 the Tamil soldiers who fought the Portuguese had sandal protection for their feet. Thus it is clear that this country had a fairly continuous military tradition which served its immediate purposes, but it failed against the superior weapons of European nations. The Arya Cakravartti, Kings of Jaffna, had good merchant fleets which helped them even in their military campaigns. When the King made preparations to attack Kotte, the king's ships transported the men and the materials to Colombo. The Royal city of Nallur continued to be the Capital city of Arya Cakravartti, Kings of Jaffna, until the Kingdom of Jaffna was conquered by the Portuguese in 1621 and it became a province of the Portuguese colonial Empire in the East. Unfortunately, after the Portuguese had conquered the Kingdom of Jaffna in 1621, all the Royal Palaces and more than 500 Hindu Temples were destroyed and razed to the ground on the explicit orders of Captain-Major Filipe de Oliveira. The stones from the foundations were removed in order to construct the Forts and Christian Churches in Jaffna. From the Royal Palaces and Hindu Temples, Priceless Jewels, Royal Crowns, Thrones and other treasures of incredible wealth were taken away. Most of the Hindu temples that were destroyed by the Portuguese were rebuilt. The Ancient Abode and other historical ruins in Nallur, Jaffna, are protected and maintained by the Department of Archaeology. It has been published in the Gazette of the Democratic Socialist Republic of Sri Lanka, No. 1,486 - FRIDAY, FEBRUARY 23, 2007. The following ancient monuments have been declared to be a protected monument under the Antiquities Ordinance (Chapter 188) (L. D. B. 277/40), by the Minister of Cultural Affairs and National Heritage. 145). Ancient Manthiri Manai Palace situated at Point Pedro Road in the Village of Nallur in the Grama Niladhari Division of Nallur Rajadhani bearing No. J-107 in the Divisional Secretariat of Nallur, Jaffna District, Northern Province. 146). Entrance of Cankili Thoppu Palace belonging to the Village of Nallur in the Grama Niladhari Division of Cankiliyan Thoppu bearing No. J-109 in the Divisional Secretariat Division, Nallur, Jaffna District, Northern Province. For more information about the Nallur Rajadhani City Layout, please click the below link.